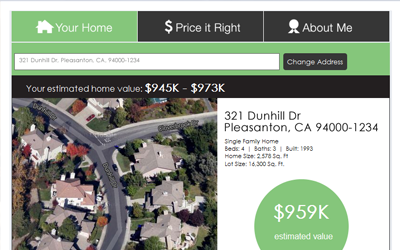 Facebook app for SmartTargeting also gives homeowners access to recent sales, price-change data and agent reviews! Today, we announced our new Facebook app for SmartTargeting, another solution to boost our customers' marketing and business needs. The new Price Your Home Right Facebook app gives homeowners the ability to adjust their home value, verify the online valuation, and syndicate it across leading national real estate websites with the help of SmartZip clients who are local real estate pros. With the free app, homeowners can also gain instant access to recent sales activity and price changes in their neighborhood. Inman News recently posted about our new Facebook app. You can check out our news coverage here. "SmartZip continues to unveil great new tools that have helped us farm our territory like never before," said our clients, Marilyn Nuber and Michael Fidanza of The Nuber Team, a real estate team located in New Jersey. "I can now better engage with my established Facebook client base and continue to build a social influence." The Facebook app for SmartTargeting offers agents a new tool to generate buyer and seller leads, and build relationships with their Facebook community. You can learn more about our products and apps by clicking here.